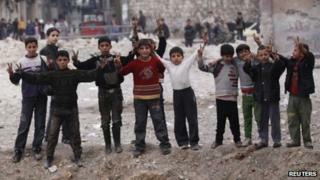 Of the many things destroyed in Syria - jobs, homes, limbs, lives - perhaps one of the most tragic is childhood. "With my relatives - and you?" "In the basement - our house was burnt out. And yours?" "It was demolished; it is not there anymore." I remember one long street of wreckage in Baba Amr district, in Homs. Not a single building escaped the shelling - all were burnt or destroyed. No signs of life. The only sounds I could hear were the gunfire and my own footsteps crunching over broken glass. "What do you do during the day? Do you play with your friends?" I asked him. Those traditional questions for children. The boy had a shy smile. He said simply: "I do not have friends any more, they all died. They were hit by a rocket and died." His smile disappeared. He covered his eyes, lowered his head in despair and walked away into the alley. Instead people talk about death. They see blood and body parts scattered in the streets. And sometimes the pale faces of children - children who might have been laughing, or maybe scared, in the moments before they heard the sound of shelling. When I met him, Rabie was trying to be composed. His eye seemed to be affected too - but there was still a smile on his face. "I will not stop, I will be a teacher one day," he told me. "We shall not stop," his mother said, trying to hide her tears. "We will get our freedom and stand up again." As soon as they saw the coloured pens and paper, they started drawing homes and revolutionary flags. One stood up and started chanting one of the revolution's songs. BBC Radio 4: Saturdays at 11:30 and some Thursdays at 11:00.